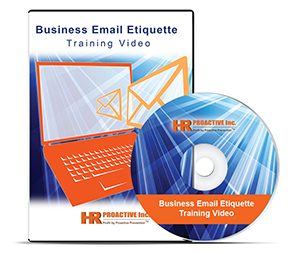 HR Proactive’s Business Email Etiquette Video DVD Program is an easy tool to help employers meet their obligation to provide best practices for the use of email as an efficient communication tool in the workplace. HR Proactive has bundled our FMLA for Supervisors + Prevent Harassment/Bullying & Violence video DVD kit(s) so that you can train seasoned workers and new hires with ease and confidence. The program quizzes will test your employees’ understanding of the concepts related to job protection during medical leaves and respectful workplaces. By practicing respectful and civil behavior in the workplace the majority of harassment complaints can be avoided! HR Proactive has bundled our FMLA for Supervisors + Prevent Sexual Harassment video DVD kit(s) so that you can train seasoned workers and new hires with ease and confidence. The program quizzes will test your employees’ understanding of the concepts related to job protection during medical leaves and respectful workplaces. Ask us about putting our compliance videos on your company's customized launch page so that your employees can access 24/7. HR Proactive has bundled our FMLA for Supervisors + Respect & Civility video DVD kit(s) so that you can train seasoned workers and new hires with ease and confidence. The program quizzes will test your employees’ understanding of the concepts related to job protection during medical leaves and respectful and civil workplaces. Our products have everything you need to conduct professional workshops. If you don’t see the bundle you want, then call to order 1.888.552.1155. Ask us about uploading our videos to your server to track your learners.